To touch and to be touched…Traditional Thai Yoga massage has an effect on one, as if hundreds of waves are touching the body. It is a privilege, in our day-to day lives, a gift to our selves. It reminds us that the healing touch is precious, while we become aware of our neglected or forgotten body parts, it offers an invitation to be at present. Thai Massage creates miracles, through magical touches on the energy pathways called the ‘SEN lines’ of the body and the acupressure points, using practitioner’s body weight rather than muscular force, for the transmission of soft but deep pressure and energy. It is a unique body theraphy and life-support system, which activates all parts of the body, invigorating, energizing and bringing longterm effects of relaxation. The mainland of Thai massage is India, but the heart is in Thailand. With its 2500- yearlong past, it was brought to Thailand together with Buddism. It is a healing art, which incorporates 5000 years of ancient wisdom of Yoga poses, Indian Ayurvedic practices, acupressure points and reflexology (face, ears, feet and hands). It was developed by Dr. Shivago, who is also said to be Budha’s doctor. Thai massage has ancient roots, but is also affective on the ailments of our modern day. It used to be practiced by the monks in the temples for medical purposes. Thai Massage also has similarities with Chinese Medicine, where the meridiens affect specific organs, whereas in Thai massage, the ‘SEN lines’ follow the form of the body. Both teachings were developed on the basis of life’s elements and the energy channels, just like Yoga’s foundation of energy centers that are called chakras and the 72,000 nadis (energy lines running through body). Thai Massage is practiced using palms, thumbs, feet and elbows. Thai Massage is powerful thanks to the deep stretches that the person by himself cannot do. 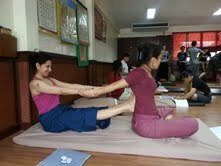 Besides these stretches, soft tissue manipulation is also part of the Thai Massage. Using pressure appropriately, Thai massage affects the whole muscular system and the joints, it has positive effects on the skeletal system. It can also reach the connective tissues and mend parts of the body that cannot be seen with eyes. It is especially effective on the lymphatic system, with specific techniques pumping fresh blood towards lymphatic areas of the body. It helps eliminate the lactic acid out of the body. Thai massage opens and balances energy blockages, which help the body’s natural energy flow more freely. It opens the body and also maximizes the body’s potential. Thai massage movements stimulate the internal organs as well. Traditional Thai Massage is for all age groups and has therapatic effects on everyone. It is practiced with soft, comfortable clothes on a thick mat, on the floor. When it is practiced in a quiet, relaxed atmosphere with a good rhytm, it stimulates the parasympathic nerve system, soothes the body, reduces stress and lowers the blood pressure. It creates a meditative state for both the client and giver. It is a holistic practice, which helps overall well being. It is believed that all parts of the body are interconnected and there is a relationship between the body, mind and soul. After a Thai massage practice, just like in yoga, one is left with a feeling of lightness and unity of the whole being. Like a magnet, my feet pulled me to the Wat Pho Temple’s garden, where the Wat Pho Medical Center is situated towards the back… This center and the Thai Massages I received here, were so special and different from all the other Thai Massage centers, which can be found at every corner just like the hairdressers in the Far East. The temple is considered to be the first public university of Thailand. In 1962, a school of traditional medicine and Thai massage was founded. The temple is home to one of the earliest Thai massage schools. 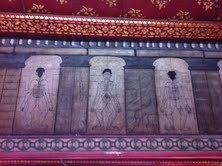 For Thai massage therapists, the medical inscription inside the temple acts as a basis for treatment. There are 60 plaques inscribed, 30 each for the front and back of human body. Therapeutic points and energy pathways known as SEN lines are engraved and the explanations are carved on the walls next to the plaques. Full research on the diagrams is still not completed.